The tight-lipped company is getting less and less secretive. Magic Leap has been peeling away one layer of secrecy after another now that it's close to shipping its mixed reality headset. Just recently, it released an AR demo and revealed that it's working with comics industry veteran Grant Morrison. Now, the company has given us a glimpse of what its operating system an interface will look like through new documents added to its revamped developer guide. TechCrunch has collected a few images and videos circulating on Twitter and Reddit, including a photo of the device's homescreen and the stock apps that'll ship with it. Yes, they're mock-ups, but they can at least give us an idea of what to expect. Other images show the platform's gallery and avatar system, both of which take on a flat, 2D look. 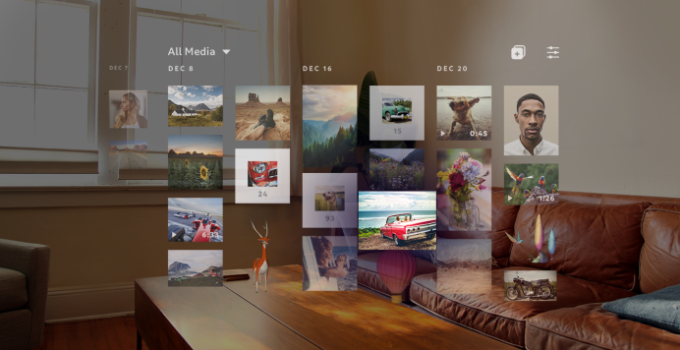 Magic Leap apparently calls those types of apps "landscape apps," and you'll be able to run several at once. The three-dimensional applications with elements that can interact with your environment, on the other hand, are called "immersive apps." They're probably the ones most people are looking forward to, considering they'll provide the experience Magic Leap has been promising since it first revealed its existence. Remember that whale breaching in a school gym and that tiny elephant that can fit in a person's palms? The company's new documents also show how in-app hand controls may look like and how you'll be able to create a multi-user experience by tapping the "Cast" button to share whatever it is you're viewing with a contact. Magic Leap recently announced that it will start shipping its mixed reality headsets this summer. The company doesn't have an exact date yet, but so long as the release doesn't get delayed, we're bound to see photos and videos of its actual interface and apps in the near future.